Q&A on the causes & cures of of dimming light fixtures or flickering lights & power losses. Frequently-asked questions on how to diagnose and fix problems with dimming or flickering lights & electrical circuits or intermittent loss of electrical power. This article series explains how to diagnose the causes of flickering or dimming lights at or in buildings. This article gives simple diagnostic steps that a homeowner can do to determine the type of electrical system problem that is causing flickering or dimming lights or intermittent loss of electrical power. We list the common causes of these problems and suggest what to do about them. Watch out: flickering or dimming lights often indicates a dangerous condition. Switch off the bad-acting appliance or circuit and ask for help from a licensed electrician. These questions & answers about dimming or flickering light diagnosis and repair in buildings appeared originally at FLICKERING LIGHT DIAGNOSIS - be sure to review the advice given there. 1. A corroded ground connection is a safety hazard but should not at all be a factor in flickering lights. If correcting a ground connection were found to make a difference in how lighting behaves we would know that the incoming neutral from the power company was defective. 2. Replacing "all electrical service connections" is a bit unclear: there are connections at the service entry - overhead or underground - at the electric meter, from the meter into the panel, in the panel to the main breaker and bus. If the flickering affects all power in the building then I agree that the problem is most likely somewhere in the main panel or outwards to the electrical service. If flickering were only on individual circuits then the problem is at the panel or downstream from that point. 3. Ruling out problem electrical panel brand as unlikely: You have a relatively recent electrical panel (Murray 200A in 2000/2001) so I'm not suspecting presence of a problem brand of panel/breaker. 4. Check for aluminum wiring: Is there any aluminum electrical wiring? In the panel, in branch circuits, on circuits to heavy duty appliances like a clothes dryer or electric range? Are the incoming service entry wires aluminum? Aluminum connections can oxidize and give a bad connection and may oveheat without tripping a circuit breaker. What was meant by "still had flicker in system till all breakers in house were off except two next to my panel and when one flickered i switched to the other to eliminate it. " switched to the other? what do you mean -you switched wires? What do those breakers control? Even when connections were re-made it's possible for there to be a bad or loose connection between an incoming aluminum service entry wire (hot or neutral) and the panel connections. Sometimes the screw (steel) binds in the terminal block (plated aluminum) so that the installer thinks the connection is secure when in fact it's loose. That's something for your electrician to check. 5. Check for damaged service entry wiring: If your service entry wiring is underground it could also have been damaged enroute to the building. That is a very dangerous situation, risking electrocution. Let me know what those investigations find.
. I had power company out 3 times and checked power to house , replaced all connections. and asked surrounding neighbors of any problems. I hired a electrician and he found only an oxidized connection on the ground of the incoming water main. my lights do not flicker when any major appliance goes on or off. stove, dishwasher , electric dryer , washing machine, fridge, microwave, oil burner , wall mounted ac are all on separate breakers. one by one I've turned off breakers and still had flicker in system till all breakers in house were off except two next to my panel and when one flickered i switched to the other to eliminate it. So every breaker in my house was turned off. does this mean it is the house main ? its a Murry box and breakers. 200 amp service . updated in 2000/01. is turning off breakers the correct way to find or eliminate an open neutral ? all appliances are new except fridge and micro but they were turned off and still had problem. no breaker is getting hot ive run different tests even had most fixtures on to cause a voltage drop but no flicker . no buzzing in panel no rust or water in panel , heat gun shows all breakers at 79 degrees. if there is a loose neutral is in the house somewhere wouldn't turning off that breaker be the best way to find it ? help! Will the electric company come out and inspect their lines if I suspect that it could be a problem witheir lines? Will they charge a fee to inspect? Sounds like a loose or corroded connection in the circuit. My plugs are working but my stove oven and fan keep going out. Oven is plugged in I checked it well and fan is hard wired. Could it be in the wall? Known problems, unspecified, could have left burned or corroded connections anywhere in the system. Possibly there is a bad connection at the meter; the problem can be on either of the 120V lines or on the neutral or ground. if a common building neutral or ground runs first into 1fl meter, thence into 2fl meter. I would turn OFF misbehaving circuits to reduce the risk a fire or shock, then ask for help from an experienced licensed electrician. So we are having some power drain issues. Its a 2 family house & we are having issues with the upstairs getting power drains..lights dimming with a humming noise. No noise or drain on first floor. We traced it down to the new remote read meters & it seems the main hum is comming from the marked 1st fl meter but the humming can be felt in both meters. Whats odd is even though the hum seems to be coming from the first fl meter its only affecting the second floor apartment. IF the dimming flickering lights are not being caused by a problem in the electrical panel or house wiring, then the problem could be in the service entry wiring outside the home - a condition that would be quite dangerous, risking shocking someone. IF your electrical panel is one of the common problem brands like FPE STAB-LOK, ZINSCO, BULLDOG PUSHMATIC, or if you are using UBI-brand REPLACEMENT CIRCUIT BREAKERS, or if your home has ALUMINUM WIRING those could also be a problem source - use the search box just above to search on those terms to find more detail. It's time to call a licensed electrician.
. I got power back but have serious dimming and if i plug appliance in the outlets just on the side i had issues with power goes out. Once i unplug power. Comes back on. Is this a short in my homes main wiring or possibly need a new power distribution box. I'd look for loose connections, for varying source voltage, loose or defective bulb connections. Generally the LED lights I've installed have lasted for many years, so I agree with you that there's something wrong with that circuit. Start right at the panel. A circuit in my house seems to burn out LED lights. There are about 10 lights connected to 2 switches. About every 3 months a bulb begins to flicker, then burns out. About a year ago I replaced to dimmer switch with a non dimmer switch but the problem persists. Is there a way to diagnose if the wiring is at fault or is it the bulbs? When something happens at a regular time often that's a very helpful diagnostic, but you've already taken the approach I'd have suggested, looking for mechanical or electrical equipment that operates under timer control.
. You might need to pursue this with Duke Energy not just asking if they have something on a timer (their lawyers may be telling them to never give out any information to their ultimate customers anyway - IMO), but instead noting that there may be a potentially fatal loose or failing connection in the local electrical distribution network. Thank you so much for this opportunity to ask a question. We have a brief light flicker plus temporary ceiling fan "hum" (as what would happen during a voltage drop) and "beeps" from microwave and computer surge suppressor/power supply (as if a brief power interruption) happening at EXACTLY the same time (3:17 a.m.) EVERY morning.
. But something must be happening either in our house or outside our house to do this at EXACTLY the same time every morning. We having nothing on a timer that could cause this -- no timed equipment or appliances. So this must be something occurring from the outside that is affecting our electrical supply at exactly the same minute every morning. Duke Energy says "nope." Any suggestions? I have not gone to my neighbors yet to see if they are noticing the same thing -- that's one thing I should do. But what do you think might be happening? Can you identify the circuit breaker for the misbehaving circuit? If so turn it OFF and leave it off to reduce the risk of an electrical fire. If you don't know how to do this ask a neighbor who can help you out. When you speak with whomever helps you turn off the circuit or when you call a licensed electrician to find and fix the bad circuit or electrical receptacle, ask him or her if your home uses aluminum electrical wiring. Also ask the neighbor or friend (or read for yourself) the brand of electrical panel/circuit breaker installed - and let us know as that may suggest other safety repairs you'll want to consider. TV was going on and off (disconnected from satellite) and a pole lamp went off and on... then off. Later back on... All the lights in the house were still on. Other side of the wall from TV is the kitchen (same outlet wires other side of the wall I guess??) and the kitchen appliances (that were off but plugged in) stopped working. Outlet in kitchen is hot and looks burned inside. I am elderly and just need advise please. I can not call an electrician right now (financially). For sure electrical problems such as lightning strikes or improper grounding + stray electrical currents can be a factor in water pipe leaks. When lighting strikes a building or near it, huge electrical surges can follow surprising pathways: tree roots, metal railings, water pipes, metal siding, metal ductwork, even moisture inside of wet wood. If the damage you found was from improper electrical wiring or failure of the electrical utility to maintain their system ground then you might have a claim, even though in most countries electrical codes require that each building also have its own local electrical ground, specifically to provide a safety feature should the utility ground be lost. If damage is from lightning, your'e in fat city if the electrical company is going to help you pay for repairs. if lightning damage is frequent where you live you should consider a lightning protection system for your building. Back to flickering lights: if lights flicker and there is NO storm going on and the electrical utility power is stable (that is the neighbors are not seeing the problem) then it's a local electrical wiring problem and the safety warnings I gave earlier still pertain. I had the same problem with flickering lights and my satellite receiver being knocked out multiple times. Also had a couple of pin hole leaks in copper piping and not sure if it is related. A plumber repaired the portion of copper pipe with plastic and I later noticed that there was electrical arcing when the copper pipe came in contact with the duct work. Electrician was called to investigate but in the meantime tried to turn on the furnace and it would not work. The furnace repair guy could not figure out the problem and said he would have to return and check every single wire because there was something wrong with the wiring and mentioned grounding.
. I was not too happy that a screw in a secure part of the main panel could become so loose and we talked about replacing the panel. Hydro then showed up at the time of the panel replacement and it was confirmed that the root of the whole problem was an open neutral on the boulevard. I am now discussing compensation from hydro and they indicate that they will only reimburse the furnace repair, a DVR receiver and the electrician's diagnostic time. Interested in any advice on whether I am being treated fairly and whether such an open neutral could cause damage to copper plumbing and the main panel. Hope this comment helps others and look forward to any advice from others. I had the same problem with flickering lights and my satellite receiver being knocked out multiple times.
. Electrician was called to investigate but in the meantime tried to turn on the furnace and it would not work. The furnace repair guy could not figure out the problem and said he would have to return and check every single wire because there was something wrong with the wiring and mentioned grounding. The electrician then came and identified that the furnace was grounded and that one of the electrical components was fried. He also identified that the water meet ground was burned out and needed to be replaced. He did so but indicated that there was something else amiss because there was current going to the water meter. He bridged the copper piping repair (with some mtal clips) done by the plumber. He then opened the main panel (the part that could get you killed) and turned a screw several times on the outside line coming in from hydro. The flickering light problem and satellite situation stabilized but the electrician still thought there was a problem somewhere. I was not too happy that a screw in a secure part of the main panel could become so loose and we talked about replacing the panel. Hydro then showed up at the time of the panel replacement and it was confirmed that the root of the whole problem was an open neutral on the boulevard. I am now discussing compensation from hydro and they indicate that they will only reimburse the furnace repair, a DVR receiver and the electrician's diagnostic time. Interested in any advice on whether I am being treated fairly and whether such an open neutral could cause damage to copper plumbing and the main panel. Hope this comment helps others and look forward to any advice from others. Mandy I can't guess at the relationship between a home security alarm and loss of electrical power. This sounds more to me like a wiring error. An overcurrent should trip a circuit breaker but won't do so if the breaker happens to be a problematic brand or model such as many FPE, some Zinsco, some Challenger or other brands. YOu need a licensed electrician to inspect the home wiring for errors, signs of overheating, defects, mis-wiring, aluminum wiring, problem panel brands. Watch out: meanwhile be sure that smoke and CO alarms are properly installed and working including battery-operated models. I just moved into an older two story house, I am renting and my landlord just bought the house so I am his first renters,so we are learning about the house together. The First night we was in the house was fine, the second night my kids woke us up sometime in the middle of the night and said all the power was off up stairs. One boy sleeps with just a fan the other boy sleeps with a fan and a TV. Down stairs lights wouldn't work either but my fan was on, so the plugs down stair where working, just couldn't turn the lights on. I notices my frig was working but not my stove. We checked the breaker, all them where good. So we went to the alarm system (that is on but not used) and hit the off button, once we did that all the power came back on. So we thought it must be a timer in the alarm system. This has happened again and when we tried to hit off on the alarm system it didn't work, All the breaker are in place, non of them got flipped. So my boys slept in the living room so they can have their fan. By the time we wake up to get ready for work and school at 7am all the power is back on as if nothing ever happened, only thing to show proof of the power being out is my stove flashing the wrong time. This has happened more than twice and today only makes a week since we have been there. My landlord had someone come take a look today and he said he thought the surge protectors was drawing in all the power, if that was the case wouldn't that flip a breaker? No breakers are getting flipped. Oh, and I unplugged the alarm system so that is completely off now. Any and all advice would be great. Thank you. I have similar problems that were described in your captioned report above. Whenever I engage high-demand devices such as my microwave, electric oven, kettle, and garage door opener, my lights go brighter and they go dimmer (back to normal) when high-demand devices finish. I see lights flickering during the entire length between brighter and dimmer. Lights that exhibit such behavior are found to be on more than one circuits (i.e. not just a particular light but all lights in the house). I also see flickering (more minor relatively) even for fluorencent tubes in my kithcen when the same condition arises. The sad news I found is that I noticed my electrical panel is the one which was described as problematic in your website (i.e. Sylvania). All the circuit breakers are also Sylvania (marked underneath). An electrician (maybe an inexperienced one) came to help me to diagnose the problem. No fruitful finding at his first visit. The panel seems clean (i.e. no burn marks) as well as for those circuit breakers. We do not seem to know what had caused the lights to go brighter and dimmer whenever my microwave turns on. Is my electrical panel the culprit based on symptoms? What should I do now? I have tested for all your suggestions which apply to me except a faulty ground whatever that is. To recap: My Intermittent flickering in equal cadence is from only one socket. The Lamp, socket, and circuit breaker all tested o.k. I Replaced socket, circuit breaker and lamp. There is No other occurrence in the sockets, circuit breakers, anywhere in apartment or the building of 165 units. No Aluminum wires, no motor interference. Just rapid fire flickering of an incandescent bulb estimated at 2-3 flashes per second equally spaced. A florescent energy saver bulb flickers slower, maybe 1 per second. I'm not certain but I believe all that is left to check is a faulty ground. How do I check for a faulty ground? …and is there something else it Could it be? …or something else not listed on your current suggestions? I don't know, Breanne, but it sounds as if either the circuit into which the flat iron is connected is overloaded OR there is a loose connection or failing element inside of the appliance itself. Since you are comparing two appliances that use the same wattage, and as the same iron doesn't cause the same symptom plugged-in elsewhere, I suspect the connection in the receptacle itself or the receptacle circuit in the bathroom. The situation could be unsafe. My flat iron (a hair appliance) (110-240V AC, 50/60 HZ, 45W) makes the lights in my bathroom dim with a pulsing rhythm. It only does it after about 30 seconds, and then stop about every 15 seconds. I think it's stabilizing its own heat during those times? However! My curling iron (also a hair appliance) (125V/250V AC, 5060 HZ, 45W) works totally fine and does nothing to the lights in the bathroom. The flat iron does not pulse the lights in the kitchen. What is the problem and does it need to be fixed? Is it dangerous to use it when the lights dim off and on consistently I know it is not a manufacturing issue because I already exchanged it for another to see. On 2016-09-16 by (mod) How about mice can they mess with the wiring? How about mice can they mess with the wiring? It sounds as if you need a licensed electrician on-site, as there are fire and shock hazards in what you describe. Certainly having half of an entire home on one circuit is asking for an overload. Common causes of flickering lights are in the article above. Does your home use alulminum electrical wiring? If so that's an added fire hazard that can show up as flickering lights. Thanks for the follow-up, Phil. NOt believing much in coincidences, who knows what marginal connection or piece of equipment was ever so slightly disturbed during other recent repairs, triggering the transformer power. Or maybe as the docs told me in Korea, "we have a diagnosis: it's just one of those things ..."
I'm not really interested in becoming a contributor. I don't think I have enough savvy to do that. I appreciate the time and effort you put into getting me on the right track and also providing others a means of troubleshooting their problems if they have a similar issue. I do know my electrician learned a little something as a result of this issue. I would like to add however, that while I was enjoying my AM coffee and non-flickering lights today, my power went out and I heard an explosion, indicative of a transformer blowing up. The power comapany is here and they're up in the bucket now. Hopefully, it isn't anything caused by my problem and the fix they did on Sunday. Phil we've added your case report to the end of FLICKERING LIGHT DIAGNOSIS - and would welcome any comments. If you want to be identified as a technical contributor to InspectApedia.com use our page bottom CONTACT link to send me email. Any photos of the bad SEC neutral or even of your panel would be helpful too. Contributors of material are by default kept anonymous unless people want to be identified. Had the local power company here yesterday. They installed a device in the meter socket that simulates a 1500 watt draw, and then measured the voltage on both legs. One side was 135v and the other 108v. That prompted him to check the transformer at the pole. : What would have happened if it was 100% severed? Question: Lost water pressure & cabin lights dim when pump tries to turn on. I have a question about a well problem at a cabin in the mountains. The well is only used a few times a year and the power is turned off during the periods of non use. The water has been without problems for years. More recently the pressure seemed to surge at one point then the next time we used the cabin the water would come on, run for 4 or 5 minutes then the pressure would drop to zero. Then a few minutes later the water would be at full pressure then 4 or 5 minutes later it would drop to zero flow. I turned off the water and when I returned to the cabin again it was the same except this time after three of the above cycles the pressure dropped to zero and didn’t come back. The next time I returned to the cabin there was no water at all. I replaced the pressure switch and there is no water flow. I noticed something odd, about every minute, the cabin lights would dim slightly for 5 to 10 seconds then return to normal. So, I measured the voltage at the pressure switch and it’s 240 volts then when the light’s dim the voltage drops to 232 volts. Dimming lights sounds like a motor that is seizing and drawing high current. Especially if that's a new condition. Check the current draw on the well circuit and figure you've either got a wiring short or a seized pump motor. I have a zebco panel and when i turn off the 100amp main i still have power, any advice? Watch out: in any electrical panel, if you still have power when the main disconnect is in the "OFF" position then this is a VERY dangerous condition as you cannot, using normal homeowner controls, turn off electrical power in an emergency, and more, it is likely that the main disconnect is not going to trip on a large overcurrent and so is not protecting the equipment and building from an electrical fire. The brand "Zebco" is not one I know, and I'd like to see photos of the equipment and all identifying labels and markings so that we can research the brand further. Use the CONTACT link found at page top, left, or bottom to send us photographs. (Zebco is a brand of fishing tackle). On a few occasions I've encountered electrical wiring connections at which power was brought into an electrical panel from more than one feeder, wired or I should say "back-wired" to the panel bus through a subordinate circuit breaker. For example if someone installed a local or backup electrical generator and connected it to back feed the electrical panel through another breaker (without a proper isolation switch) you could find that the panel is energized even though the main disconnect was off. Panel backfeeding without an isolation switch to prevent both main disconnect and backefeed source from powering the panel at the same time is improper and unsafe and would need to be connected. Presuming that you don't have a back-fed panel from a second electrical source then you immediately need a licensed electrician to replace the faulty circuit breaker or if necessary the panel. i have a open nuetral at home showing at the recepacle i used a plug in tester and it shows that,the basement is finished no drop ceiling and upstairs as well where can i go from this point. You need to trace the circuit wiring, Gary. There are quite a few devices that can help you do that - check online or at your local building supplier. Question: apartment fire, aluminum electrical wire: does it need to be replaced? A fire occured in a unit of an apartment building. all interior finished on the walls had to be replaced, the electrical wiring is aluminum. Does the wiring needs to be replaced with copper to meet the building code? Charles, building codes don't explicitly require replacement of aluminum wiring though there are code sections that allow that interpretation. Watch out: I'm not an expert on repairing fire-damaged wiring but it seems to me the concern would be that the wiring insulation has probably been compromised - made unsafe - by exposure to the heat of the fire. Therefore it's likely that an inspector would want it replaced regardless of whether it had been originally copper or aluminum conductor wiring. I'm using the usual electrical tester to confirm if some areas where there once light fixtures are "hot." Most of my readings are correct as the tester works on installed fixtures and outlets. My problem arises when the tester does not show a hot area when the switch and light are both on. Any reasons for this? GM I can't quite figure this one out. The only thought that occurs to me is a wiring snafu; if we connect a neon tester between two hot legs on the same phase (rather than a hot leg and a ground or neutral) it will now show current flow. 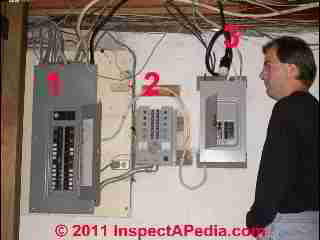 Anon if power is on for all circuits at the electrical panel then an electrician will trace the circuit to find the open connection. Meanwhile turn off that circuit to be safe. Danny I'm not clear just what happened. You are describing what I'd expect to be found to be a voltage surge coming in from the power transformer. You'll want to check with your electrical company who may need to check the step-down transformer. Keep in mind that other failures such as a lightning strike or a short circuit also cause power surges that damage equipment.
. When we check this fan in our factory again we 900 rpm as per our desired. Danny, we may be confusing voltage (nominally 120V so your 117V is normal) and amps or current. If lights dim I suspect either bad wiring connections or an overloaded circuit - too many things ripunning on one circuit. Check too that the ampacaty of the circuit breaker or fuse is properly matched to wire size so as to avoid a fire. Check too for problem brand breakers that may not be tripping earn they should in rennes to overload - aLso a fire risk. I have a rental built in the late '50s. The electric panel is an older 50 amp service with an aluminum wire ground that is routed to the water heater closet where it is grounded to the cold water supply line. My tenant says when she is using her clothes dryer and runs her vacuum at the same time. The 115 circuit breaker blows for the outlet the vacuum is plugged into. The dryer is on a dedicated 220 30 amp circuit. When I checked on my own, I found that the aluminum conductor had been cut apparently when someone had replaced the water heater at some point. Could this severed ground line be causing the interaction between the 200 30 amp dedicated circuit and the 115 15 amp breaker that is tripping? Watch out: A missing electrical ground connection is DANGEROUS as the electrical system is then lacking a critical safety feature. That shoudl be repaired. But a missing ground won't explain an overloaded circuit that trips the breaker; more likely the circuit is simply overloaded when both devices are running at once OR one of the devices is shorting to ground somewhere else. We bought a 1978 double wide mobile home a few months back. My daughter's bedroom was missing a light fixture; upon installing it, we put in one of those bulbs which need to stay lit for at least 45 minutes for maximum effectiveness. Look for a lost connetion in an electrial box upstream from where wiring feeds into that room - or in the panel itself. Also if your home has aluminum wiring that's unsafe - search InspectApedia for ALUMINUM WIRING HAZARDS to read those details. Continue reading at FLICKERING LIGHT DIAGNOSIS - home, or select a topic from closely-related articles below, or see our complete INDEX to RELATED ARTICLES below. 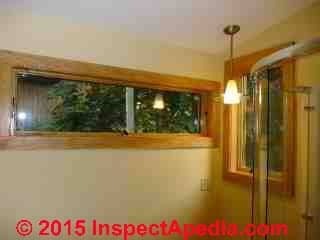 FLICKERING LIGHT DIAGNOSTIC FAQs at InspectApedia.com - online encyclopedia of building & environmental inspection, testing, diagnosis, repair, & problem prevention advice.